What is iCloud and how do I use it? Technology evolves with the goal of making life easier. With each update, breakthrough, and invention, technology is creating even faster ways to experience more and enjoy more. With how fast we’re moving forward, it can be hard to keep up. That’s why we’re here. Our Explained series helps you get the most out of your tech and makes life just a little bit easier. 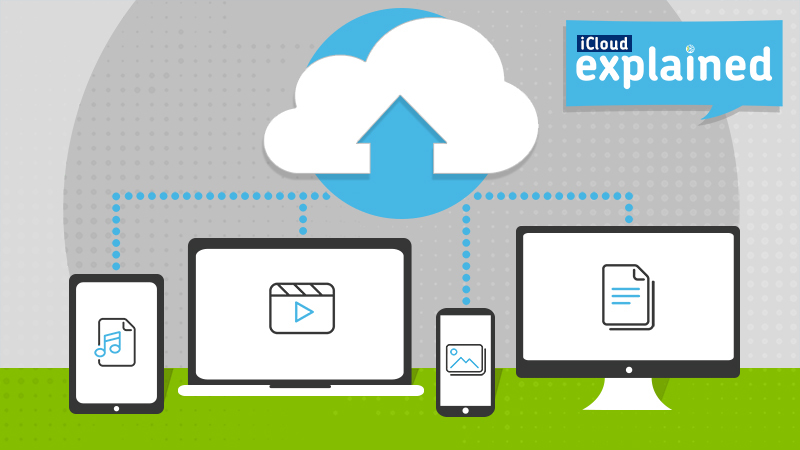 And that starts with getting back to the basics – today, we’re talking about iCloud. iCloud is Apple’s cloud-based storage that securely holds your music, photos, videos, documents, and a lot more. With iCloud, you can access your information across any of your devices. You can even use iCloud to help you find your device if you misplace it. Why should I use iCloud for my iOS devices? Simply put, it makes life easier. It’s an easy way to store important pictures, contacts, and documents in case something was to happen to your phone. According to Asurion’s claims data, more than 70 million phones are lost, stolen, or damaged every year – so, it’s best to have a storage back up plan in place, just in case. An added bonus: when you get a new phone, using iCloud makes it easy to transfer everything from your old device to your new one. There are several ways to set up iCloud from an iOS device. Once you set it up on one device, you can turn iCloud on your other iOS devices like your Apple Watch or Apple TV. Go to Settings > iCloud, enter your Apple ID and password. Then, turn on the features you want to use. Go to the Apple Menu > System Preferences, select iCloud. Enter your Apple ID and password, then turn on the features you want to use. Turn on Wi-Fi. Your device will automatically search for available networks near you. Tap the name of the Wi-Fi network you want to join. For a smoother transfer, make sure your software is updated. Tap Settings > General > Software Update. Open the Settings app and tap [your name] at the top. If you don’t see your name, tap Sign in to your iPhone. If you don’t have an Apple ID, you’ll need to create one to access Apple services like iCloud, the App Store, iMessage, and more. On the next screen, tap iCloud and then turn on everything you want to save. Tap iCloud Backup to turn it on. If you receive a message about disabling iTunes backup, tap Ok. Tap Back Up Now. Make sure to stay connected to Wi-Fi. If you’re concerned about storage space, go back to iCloud> Manage Storage. 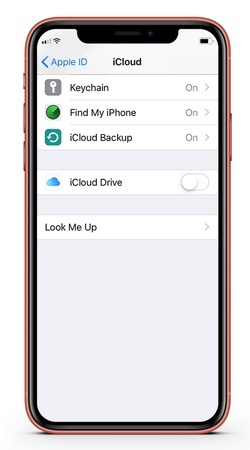 Automatic backups keep your data stored and updated in iCloud in case of an emergency. iCloud automatically backs up your phone every time it’s plugged in and connected to Wi-Fi – making it easy to keep everything up to date. Turn on/off each item you want to back up automatically. You can turn off backup for any apps that you don’t want included in your automatic backup. This can also help conserve iCloud storage space. Tap iCloud > Manage Storage > [This “device”]. Turn on/off each app you want to remove from the backup. 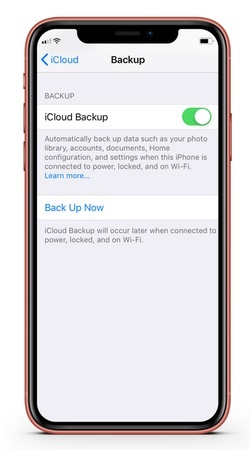 If you delete content from an iOS device with automatic backups enabled, that content will also delete from iCloud. 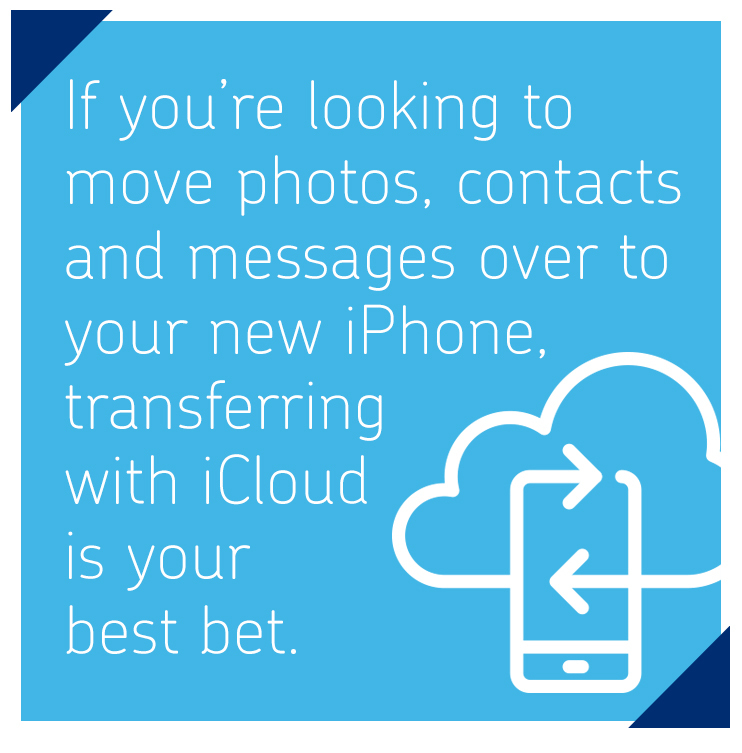 If you’re looking to move photos, contacts, and messages over to your new phone, transferring using iCloud is your best bet. First, you’ll need to back up everything from your old phone. Think of backing up as packing all your valuables into boxes before you move. To back up to iCloud, you’ll need your Apple ID and a Wi-Fi connection. If you’ve already set up your iPhone, you can still restore your content from iCloud – but you’ll need to reset your new phone and go through the initial setup again. To ensure a smooth transfer, make sure you have the latest software version by tapping Settings> General > Software Update. If an update is available, tap Download and Install. Wipe your phone clean before you pull everything from iCloud. Tap Settings > General > Reset > Erase All Content and Settings. Your phone will turn off and bring you to the initial “Hello” screen. Once you get to the Apps & Data screen, tap Restore from iCloud Backup. Select your latest backup to start transferring your data. It’ll take some time for everything to restore, so don’t worry if your apps are grayed out or your photos aren’t loading yet. If you want to store your photos in iCloud, make sure you turn on iCloud Photos. If you’re running out of storage space, select Optimize iPhone Storage instead of Download and Keep Originals. Make sure you have the most recent software update on your iOS device. Go to Settings > General > Software Update. If there is a new update available, tap Download and Install. Check to see the last time you backed up your device before you restore it. Go to Settings > [Your name] > iCloud > Manage Storage > Backups. Go to Settings > General > Reset, then tap Erase All Content and Settings. Select Choose Backup and then choose from the list of backups in iCloud. We know it’s tricky to keep track of usernames and passwords for all the accounts you use on your phone, like social media, online banking, and email. Thankfully, there’s a way to make it easier. iCloud Keychain remembers your passwords so you don’t have to. Keychain safely stores your login details, so you can access them from any of your Apple devices. Open Settings and tap your name at the top of the screen. Tap the switch to turn on iCloud Keychain. You can use Keychain on your other Apple devices as long as you are signed in to iCloud. The next time you sign in to an app or website on your iOS device, Keychain will prompt you through a notification and ask to save your login information. Once saved, Keychain can automatically enter your information the next time you want to log in. For more secure accounts, like your online banking, you may have to use Touch ID to access your password from Keychain. We’re here to be your go-to resource for all of your tech needs. We’re always learning and asking “what if?” so we can share insights that will make you say “I get it.” Because our goal is to help make your life easier by unlocking the potential of tech.